For the Dough: In a small mixing bowl add the masa harina and about 1/2 cup of water to start. Using your hands, gently knead the dough. Note: getting the right texture is important, you want the dough to be as moist as possible without sticking to your hands. To do this, continue to add the additional water one tablespoon at a time until you reached the ideal consistency. If the dough is cracking, add more water. Form the dough into 12 equal pieces and roll into balls. Cover the dough balls with a damp towel. Set aside. 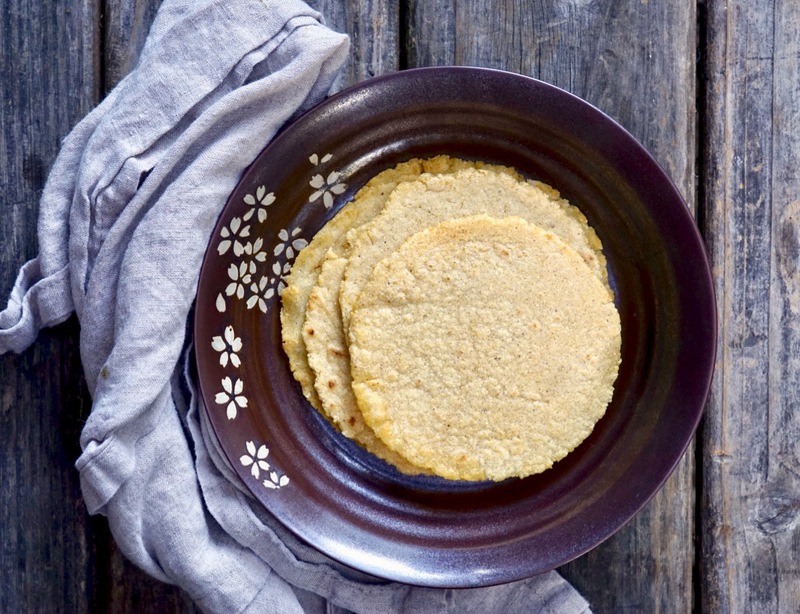 Pressing the Tortillas: Prepare your 7-inch tortilla press by cutting two circle pieces of a freezer bag to fit the tortilla press and prevent sticking. Open the press and place one circle on the bottom plate and the other on the top plate making sure there are no wrinkles. Working with one dough ball at a time, gently flatten it into a disk with your fingers, set aside. Place the tortilla press with the pressure handle closest to your dominant hand. With the press open, and a piece of plastic on the bottom and top, place the disk in the center of the bottom plate. Close the top plate, ensuring that the second piece of plastic is secured on top. Fold the handle of the press and apply pressure. Fold back the handle and open the press. Carefully peel the top plastic for the tortilla. The tortilla should be about 5 inches in diameter and about 1/8th inch in thickness. Flip the tortilla over onto your empty palm, and carefully peel off the second piece of plastic. Repeat the above with the remaining dough. To Cook the Tortillas: Fold a cloth napkin or clean kitchen towel in half and place on a plate to hold the cooked tortillas. Set aside. Lightly oil a large cast iron skillet and place over medium-high heat. When hot, but not smoking, add one tortilla at a time and cook for about 15 seconds until the tortilla begins to change color. Using a metal spatula, gently flip the tortilla and cook for an additional 10 seconds. Transfer the tortilla to the prepared cloth and cover to keep warm. Serve with your favorite dish that calls for tortillas.